This year, the Engineering Challenge will have two female alumni as International Challenge Masters (ICM) for the first time ever. The even cooler part? They competed against each other when they were participants! Check out our interview with Destination Imagination (DI) volunteers Crissy Buhr and Jackie MacLeod. Tell us about your life, both DI and in the real world. Crissy Buhr (CB): I grew up in a small town of 1,000 people in Northwest Wisconsin and competed for nine years in Destination Imagination. I attended the University of Wisconsin-Madison, where I triple majored in Theatre, Political Science and International Studies with an emphasis in Global Security. I thought I would be a doctor, but when I left college, I was not going to be a doctor. I ended up interviewing for a position as a Business Analyst/Project Coordinator because the interviewer thought my resume and DI background would make me a great fit for the job. I spent 10 years working in Management Consultant working in IT Product Development and Implementation as a Business Analyst, Project Manager and Product Manager where I bring order to chaos and help make ideas a reality. I currently work as a Project Manager on the Client Delivery Team at a health Tech Startup in Madison, WI where I split my time between Product Development and Client Implementations. This year marks my 25th year in the Destination Imagination (and previously OM) program and I’ve held almost every volunteer role, except that of a Team Manager. Jackie MacLeod (JM): I grew up in a suburb of Toronto, Ontario and was introduced to creative problem solving in 1996 as a sixth-grader through Odyssey of the Mind. Michael Howard, a fixture in the Engineering Challenge and longtime ICM, was my teacher at the time and suggested the program to a small group of us. My mom vividly remembers me coming home and telling her that we were going to build a car and travel through Mr. Howard’s brain, because apparently, we were initially considering the Technical Challenge. We quickly abandoned that however and found our true home in the Engineering Challenge. While we had many members move in and out of the team over the years, there were two of us who competed together for seven years, and we managed to advance to Global Finals each time. Twice, we actually advanced for 2 Team Challenges in the same year. My time as a competitor wrapped up with Global Finals 2002, and I quickly found my way into the other side of the program, as a volunteer. This marks my 24th year with the program. Over the years I have held many roles, often filling in wherever I am needed in a given season. I’ve done every appraisal role and have been the Affiliate Challenge Master (ACM) for all but the Technical Challenge and the Service Learning Challenge at some point over the last 16 years. For the last seven years, I’ve been living in Nova Scotia, and I help out with the Affiliate here wherever I can. Outside of DI, I am a mom to a busy and curious two-and-a-half-year-old boy. He was the reason I missed Global Finals 2016, my first year as an ICM, as his due date was the last day of the tournament. I work as a Recruitment Administrator for the Canadian contact center of one of the largest car insurers in the UK, a job not at all related to my degree in Biological Engineering. While I would never have expected to end up in the world of Human Resources, I’m using my analytical skills to help our departments make more data-based hiring decisions and bridge a communication gap between our operations teams, who are very metrics driven, and our Human Resources team, where there are a lot more grey areas. 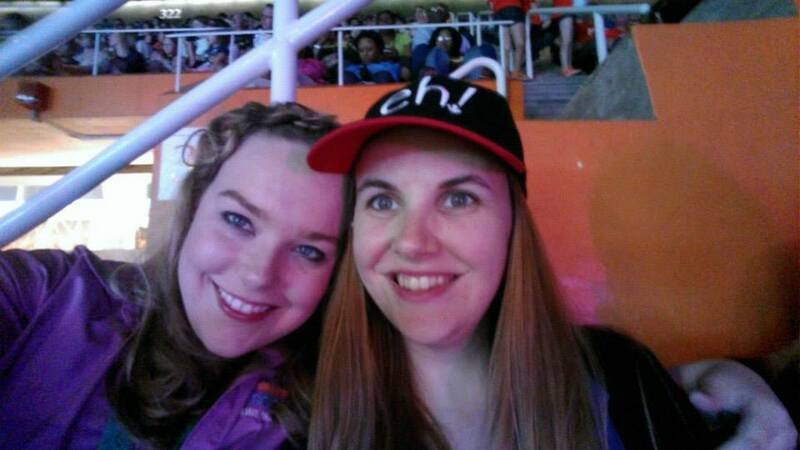 Crissy Buhr (left) and Jackie MacLeod at Global Finals 2013. DI is celebrating its 20th year of creativity! What was your favorite Team Challenge as a participant? CB: I would have to say my favorite is It’s Not ImPASTAble, the first-ever Engineering Challenge (formerly called the Structure Challenge) for Destination Imagination. It may have something to do with the fact that my team won Global Finals that year. As I reflect back on that first season, we were handed a copy of the Challenge by our Team Manager and told that we needed to build a structure out of pasta and glue. Our builder almost quit, but we talked him into staying. We thought our structure was terribly heavy and we had no shot of making it past the Regional Tournament, let alone making it to Globals. It weighed in at 59 grams (the previous year our balsa structure couldn’t weigh more than 15 grams so it was quite a shock) and held 600 pounds—turns out our ratio was the best in the world! People were literally weighing structures on bathroom scales. I made six-foot tall hot air balloon out of tissue paper that inflated with a hairdryer that kicked off the dream sequence in our skit. It literally looked like we had no props until we turned it on and then it certainly was a ‘wow’! JM: That’s a tough one. While the Engineering Challenge always was and always will be home for me, I think I’m going to have to go with Create and Animate. This was a Fine Arts Challenge, which was new territory for us, but we came up with a fun story about some misfit dolls, composed some killer original songs, and even made miniature rag doll versions of the entire team as part of our solution. We were thrilled to advance to Global Finals and were beyond excited to place 8th in the world. What brought you to the Engineering Challenge? Why is it so important to you? CB: I actually spent my first three years on teams doing the Fine Arts Challenge. In sixth grade, I was on a team that fought constantly. My best friend and I realized that while we loved the program, we needed to get off the team and didn’t care which Challenge we did. We joined a new team and the Challenge that they picked was the Engineering Challenge. That first year was a little rocky, but I loved rolling up my sleeves and building things and deep diving in, and I haven’t looked back since. For me, the Engineering Challenge is important because it’s where I found my home. It was a place I could put on heels and lipstick and make a great costume but also roll up my sleeves and use some power tools to build something. I felt like the folks in Engineering just ‘got me’ and I could be me. I learned early on that one of the greatest assets I could bring to my team was my project management skills and my ability to systematically break things down to figure out how to solve things or maximize points, or figure out how we could do best in Instant Challenge. I loved the testing and the analyzing and the reworking. I loved the satisfaction of seeing how simple materials can be put together to become incredibly strong. I loved the suspense of wondering if our structure would hold and then the satisfaction of watching the weights pile on the stack. I still love that the Engineering Challenge is logical and systematic. It’s procedural. But it’s also not. You have all of the Structure Testing procedures going on at the same time as a theatrical skit that is anything but systematic. There is beauty in that juxtaposition and I can’t get enough of it. JM: The first year I participated in OM, we fell into the Engineering Challenge and never looked back. One of my teammates, who was with me from start to end of my years of participation, has a natural talent for designing and building structures. I fell naturally into the role of “managing” the team. We had a Team Manager, but some years he had up to 14 teams competing at our Affiliate Tournament, so I was the person that stayed on top of organizing us, completing paperwork, and setting deadlines. I loved helping the rest of the team write the story and build props too, but it was really how well we worked together that kept us forming teams together through high school. Though I dabbled in other Challenges, I never abandoned Engineering, those years we just picked up a second challenge. The Engineering Challenge is so important because it really does encapsulate a lot of skills that someone needs to do well in the engineering field, with a fun twist of course. I often joke that my first year Engineering Design course in college was a DI Challenge. We had to work together to build a car from a mousetrap, on a set budget, and then do a short sales pitch about our product. Aside from the presentation aspect being more formal, I can’t think of any experience that was more directly transferable than DI. Learning to work with a team, overcome obstacles, and come up with a final product is everyday work for a not only a lot of engineers, but people in all kinds of professions. How did you become an ICM? CB: Before I ended up as an ICM, I was an Affiliate Challenge Master and a Regional Challenge Master and before that, I was an Appraiser. You don’t just start as an International Challenge Master. Sure, you know a lot about the DI program as a participant, but ‘life on the other side’ takes some getting used to. In 2010, I returned to the Engineering Challenge in 2010 as an Appraiser and worked hard, asked good questions of the teams, caught issues in paperwork and double scoring, handled writing up deductions, and brought great energy and knowledge to my Appraisal Team. I was eventually asked to be a Head Appraiser at Global Finals and through that role, I was able to show that I was ready to be an ICM and was eventually tapped for the position. JM: Once I started with DI, I just never left. All kidding aside, I don’t think it ever crossed my mind that I wouldn’t be involved after I graduated from high school. I went straight from competing into appraising and have been really lucky that my dedication to the program offered me the opportunity to contribute as a Global Finals volunteer every year. Michael Howard, who taught me for years and initially introduced me to the program in 1996, saw me come up through the program firsthand and had confidence that I would be a great fit as a Central Challenge Appraiser at Global Finals, and as I gained more experience, in the ICM role. After many years in the being an Appraiser and then Head Appraiser at Globals, I was invited to step into the role of ICM. This year is incredibly special with both of you being the first time the Engineering Challenge has ever had 2 female International Challenge Masters. What can DI do to help get more girls interested in this Challenge? CB: I think as women we need to stop being afraid to try something we have never done before that we perhaps don’t YET have an aptitude for. I think for many girls, they have a background in theater, dance or music and choose Challenges based on what they already know how to do and looking for the familiar versus looking at the potential for what else they can do. I think we need to start focusing on all the skills that make up great engineers and stop focusing on asking girls ‘do you want to build stuff?’ We should be asking girls questions like: Do you like to create things from lots of materials and turn them into other things? Would you get excited if you got to make something, test it, make observations and then make changes to make it better? I think if we stop asking girls if they want to BUILD something and start focusing on all the great skills they can bring to the table we can stop putting them in a box and open up lots of possibilities. Because they might not know that they do. And if they never try, how will they know?